Chris Bosh ~ Not an addition, but a centerpiece... Agree? Am I the only one who's over Bosh? I think it's great to have high self-esteem, but why is it that (i.e. to me) he's the one who seems to be talking the most? 2010 FIFA World Cup Predictions ~ Brazil to win it all? Agree or Disagree? With the USA eliminated from competition, I'll admit that I've tuned out of the World Cup. If walking by a TV, with a match on, I'll stop and check the score ~ but I really have no idea anymore about who I want to win. I received the following message today from my good friend, Kanak. I found it funny that she even sent it, since she's not a sporty person. To be honest, I nearly fell out of my seat when she texted me (i.e. during Game 7 of the Los Angeles Lakers v Boston Celtics series) that Sasha Vujacic needed to shave! I couldn't believe the girl even had the TV on still, much less was watching and cared enough to read the names on the jerseys. She said she checks into this blog ~ and now I believe her. 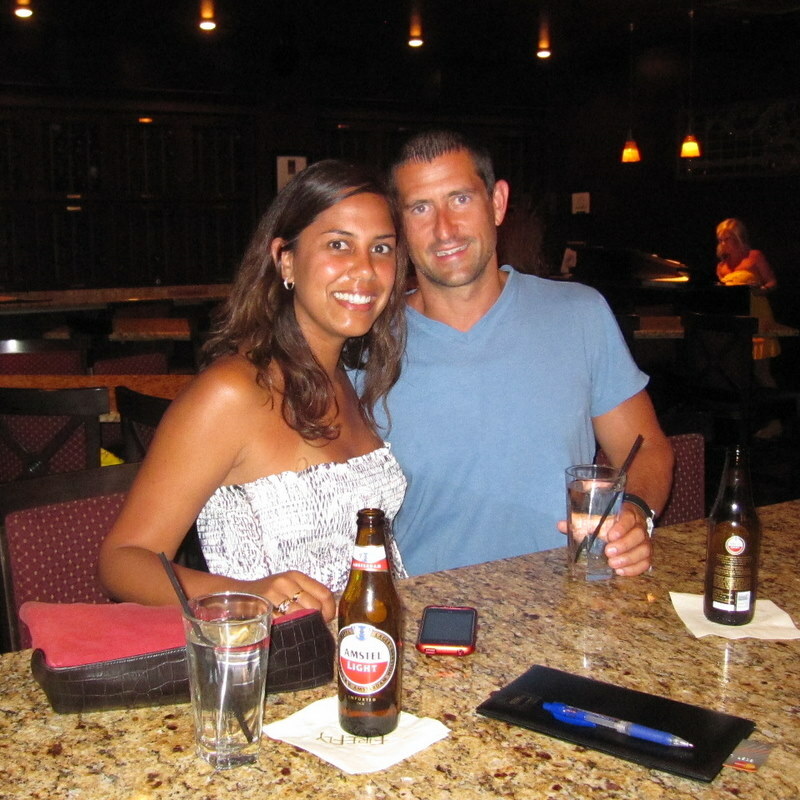 Further, being that she lived in Brasil/Brazil, she does have interest in soccer/futbol. 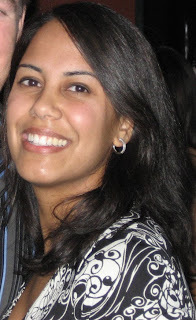 So here are her 2 cents and predictions for the rest of the 2010 FIFA World Cup.
" Ok...Soooo I wanted to send my predictions to you. I know you aren't that into soccer, but I am super EXCITED, and you are the only one that might half way care now that the US is out." Argentina will beat Germany easily, to face Portugal next (i.e. who will beat Spain today and move on to beat either Paraguay or Japan). I couldn't care less about either of those teams and who wins that game (i.e. 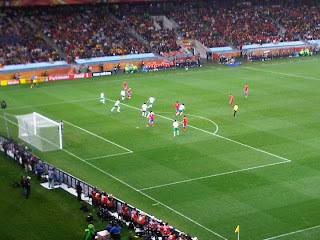 Paraguay v Japan). Brasil/Brazil (will make it to the semifinal because they are playing the Netherlands for the spot, and if they lose to them I just have to hang my head in shame...lol!. Brasil/Brazil will probably face Uruguay (i.e. even though Ghana was looking strong, I don't think they can beat Uruguay), as a face-off for the 1950 World Cup Final, but hopefully with inverted scoreboard (2 x 1 Brasil, this time). Argentina will make it to the semi-finals for sure. I don't care what people say about Germany, I don't think they are going. Final Brasil/Brazil v Argentina, neighbor x neighbor, mortal enemies. And if all goes well Brasil/Brazil will be the NUMBER ONE! Woohoo!" **** What do you think? 1950 World Cup? What is "inverted scoreboard"? Is she right? For those of you that have never been to the Staples Center, here's the video that was shown on the scoreboard before the Los Angeles Lakers home games (i.e. 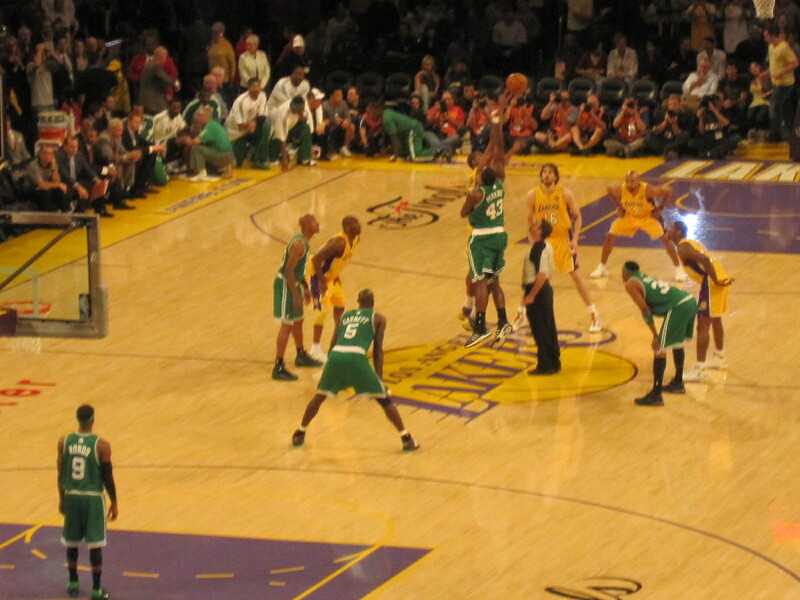 during the 2010 NBA Finals against the Boston Celtics). I shot the video before Game 6. Enjoy! **** I know I'm late, with this post. I was on vacation. That doesn't mean I don't have something to say. I was at the gate ready to board my flight, when the gate agent got on the intercom to announce that my flight would be delayed. It just so happens I was talking on the phone when the announcement was going on. I heard it just fine (i.e. along with the other 100 people at the gate), but some strange lady in orange pants started waving her hands in front of me to try to shush me. If you read this blog, you also know that I don't like people who wave their hands at me to get me to do or NOT do something. Regardless, the lady spazzed out again while sitting down an hour later and some other strangers had to help her get some airport personnel to attend to her. Who knows what the lady's issue was, but at least she had a team of 5 people to handle her. On Thursday, my flight was supposed to leave Minneapolis around 5:30 PM, but left around 11:15PM instead. Awesome. Does anyone even know that Minneapolis/St. Paul Airport had a G Terminal?!?! I had no idea. It's faaaaaaaaaaaaaaaaaaar. Regardless, There's nothing anyone can do about a flight delay and this blow wasn't as devastating for me, since it gave me a chance to watch the NBA Draft. I love the NBA Draft when the draft pool is loaded with talent. I'm not going to sugar coat it. In comparison to the 1996 NBA Draft, I think this year's draft pool was relatively shallow. Allen Iverson* (SG) United States Philadelphia 76ers Georgetown-So. Marcus Cambyx (C) United States Toronto Raptors UMass-Jr.
Shareef Abdur-Rahim+ (PF) United States Vancouver Grizzlies California-Fr. Stephon Marbury* (PG) United States Milwaukee Bucks (traded to Minnesota) Georgia Tech-Fr. Ray Allen* (SG) United States Minnesota Timberwolves (traded to Milwaukee Bucks) UConn-Jr.
Antoine Walker+ (PF) United States Boston Celtics (from Dallas) Kentucky-So. Lorenzen Wright (C) United States Los Angeles Clippers Memphis-So. Kerry Kittles (SG) United States New Jersey Nets Villanova-Sr.
Samaki Walker (PF) United States Dallas Mavericks (from Boston) Louisville-So. Erick Dampier (C) United States Indiana Pacers (from Denver) Mississippi State-Jr.
Todd Fuller (C) United States Golden State Warriors (from Golden State via Orlando and Washington) NC State-Sr.
Vitaly Potapenko (C) Ukraine Cleveland Cavaliers (from Washington) Wright State-Jr.
Steve Nash* (PG) Canada Phoenix Suns Santa Clara-Sr.
Tony Delk (SG) United States Charlotte Hornets (from Miami) Kentucky-Sr.
John Wallace (PF) United States New York Knicks (from Detroit via San Antonio) Syracuse-Sr.
Walter McCarty (PF) United States New York Knicks (from Atlanta via Miami) Kentucky-Sr. I told you that the 1996 NBA Draft talent was deep! This year was different. If you didn't know ahead of time who the #1 (i.e. John Wall) and #2 (i.e. Evan Turner) picks were, then you either don't like basketball or you're stupid. Like I said, I'm not going to sugar coat it. Stuck at the airport, I had no choice but to pony up in front of a TV and watch the NBA draft and READ the closed captioning. After a while that is no fun. So, with my trust iPhone in hand I logged into my Twitter account to see what people had to say. I follow some really intelligent people in sports who are in the know, and I also follow some clowns that make me laugh with their 140 character posts. I sat there and almost accidentally spit out my drink reading the tweets, when the Utah took Gordon Hayward 9th. I laughed out loud after reading some of the comments when the New Orleans Hornets drafted Kansas' Cole Aldrich at #11. As soon as Aldrich was selected one of my friends who I follow wrote that "Chris Paul was as good as gone." I laughed. Then the Hornets agreed to trade Aldrich and guard Morris Peterson to the Oklahoma City Thunder for the Thunder's 21st and 26th picks in the first round. I couldn't wait to see Kevin Durant's face to decipher his reaction to the trade. Actually, now that I think about it, I follow KDThunderup on Twitter and I can't remember if he reacted or not. Read into that, what you will. Interestingly, with the 23rd pick, Trevor Booker was the first senior to be drafted by the Timberwolves. Read into that, what you will. During the draft I noticed a post that David Aldridge wrote saying that Rasheed Wallace was going to retire. That was my chance to Tweet that on a day when everyone welcomes rookies to the league, it's always important to remember the veterans! I haven't read Bill Simmons' NBA Draft Diary post yet. Like a kid on Christmas, I anxiously look forward to it every year, Simmons' basketball knowledge is so deep that I use it as a litmus test to see if I still "have it". If I get lost and don't understand his references, it's a sign that I need to study-up some more. My brother isn't a formidable opponent, even though he like to think he knows his basketball history ~ he doesn't. Usually he hits me with some highlights from Simmons' piece and a couple of questions, but since he's in Cape Town this year (i.e. World Cup), I'll forgive him for slacking this year. John Wall is a Washington Wizard, Stephen Strasburg is a Washington National. Donovan McNabb is a Washington Redskin. Alex Ovechkin is a Washington Capital. In the course of a few years, Washington DC has become a "sexier" town for athletes. Now, all Washington needs to do is show the rest of the teams that it can WIN. 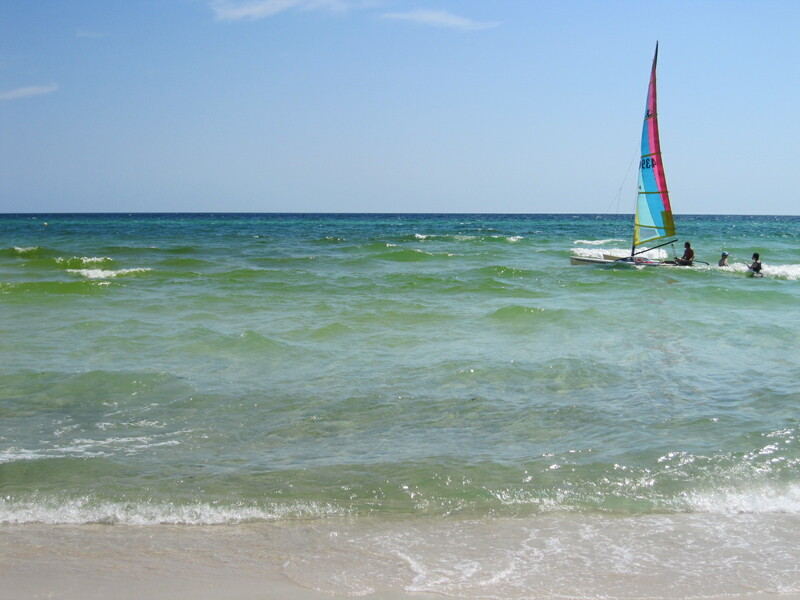 Vacation <-- One of my favorite words in the English language. Vacation <-- What Mr. Wright talked me into, and I'm much more relaxed, tanner, and happier as a result of it. Call it my 7th inning stretch. I started this blog in January to chronicle my sports, music, and travel adventures and give my 2 cents on any topic that interested me. After 6 months of INTENSE travel for work and Wirk, I needed a break ~ even if it was a short time-out. 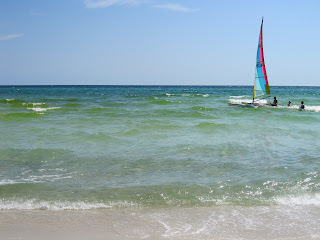 I was in Panama City Beach, Florida on family vacation over the weekend. It wasn't my family, but hey ~ those are just details... 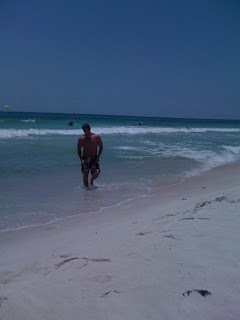 I'd never been to PCB before, and I hadn't seen my friend in almost 2 years. So, when Mr. Wright asked me to join him on family vacation, I said YES. I met Mr. Wright years ago when I lived in Atlanta. He and I built a friendship through the years (i.e. met in 2002). As soon as I saw him, I had a crush. He's handsome, it was inevitable. I shared an apartment with a coworker and whether I'd be out with her or out with friends, it just seemed like every weekend, he was always there. We wouldn't really go out much, but we always had fun. My first trip to Turner Field was on Easter, when he took me to a Braves game. Mr. Wright loves baseball but hates professional basketball. Yes, even Mr. Wright is not perfect, LOL. We've seen Prince at Philips Arena. Remember Music Midtown in Atlanta? 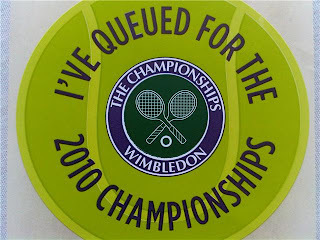 We were there for its final year in 2005. He wanted to see Common, and I wanted to see Kanye (i.e. sure enough they came out on stage together). We went to Las Vegas to bet the Super Bowl. He had the New England Patriots, and I won on the New York Giants +12.5. He might be Mr. Wright, but I was Ms. Right, that Sunday! Vegas again for his 30th birthday. Why?!? Because, that's what you do for the people that matter in your life. You spend time and you take care of your friends and even though miles separate, you find ways to keep in touch. My friend takes care of himself (i.e. eats right and exercises) so he looks great. His personality equals his appearance. His friends refer to him as a "Manther". When I first heard it I couldn't help but laugh. If you don't know what it is, look it up. I don't know whether I agree or not, but I will tell you that he's not old. I can't spend a couple of days with all the people I want to in my life, but I am definitely happy I was able to a time out and focus on the waves of the ocean, hang in a pool, have dinner, and walk the beach while looking for ghost crabs with my friend, Mr. Wright. Don't know what a ghost crab is? 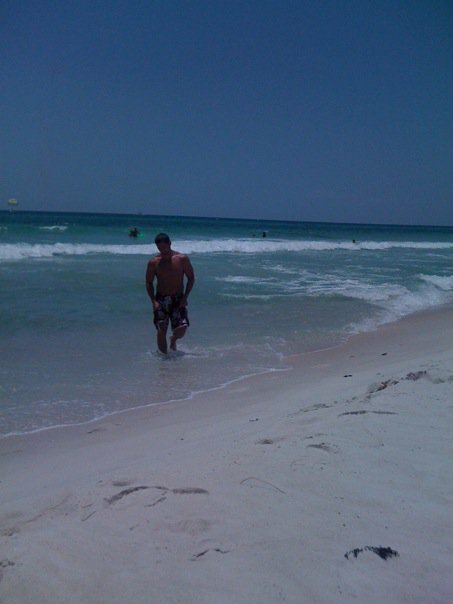 Neither did I, but they're a bunch of them in the shallow water on PCB at night. Kids are out there with nets and buckets trying to catch them. If you've never seen one, check out this video. **** No, I did NOT shoot this video. I just found it on youtube. "There are times.. when you'll need someone..
special for you, and me.."
Thanks for making me take a much needed time out, Mr. Wright. See you next time! Today it was announced that there will be an additional date added for the JAY-Z and EMINEM Unite concert(s) in New York at the new Yankees Stadium. There was a presale for the Monday show earlier today, but both shows goes on sale tomorrow at 10AM. However, for the Tuesday show, New York Yankees season ticket holders get a 2 hour advance jump on buying up tickets. If you haven't seen Jay-Z or Eminem, you need to get yourself to the show. You will NOT be disappointed! Jay-Z is amazing in concert and Eminem has left me speechless (i.e. in a good way). My favorite Eminem performance was during the Anger Management Tour years ago. His performance of Evil Deeds left me with chills. Here's the best I could find of him performing the number live in NY. Enjoy, but if your ears are sensitive to language (i.e. mom, this means you), don't click the video. Today at The All England Lawn Tennis and Croquet Club, John Isner and Nicolas Mahut battled. To say that it was a marathon, isn't doing it justice. It was the 2nd day of their 1st round match. Today, the players ended their outing tied. 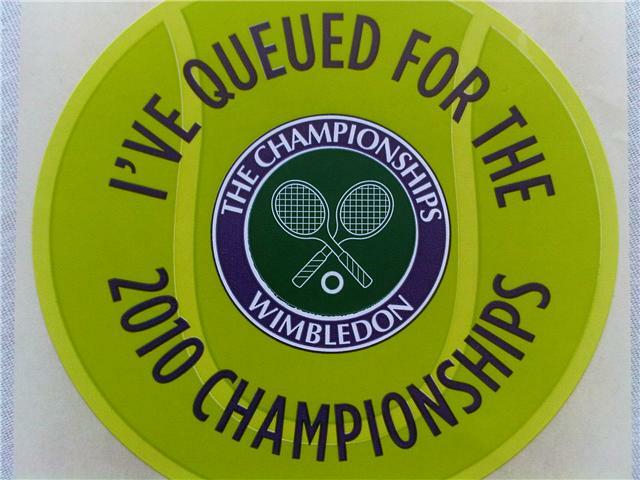 Each had 2 sets each and the 59 games EACH in the fifth set. Yes, you read it correctly, 59 (i.e. fifty-nine)! Isner and Mahut had their play suspended after 7 hours, 6 minutes on court, due to darkness. It doesn't surprise me that there's already a Wikipedia page for the match, since it's definitely one for the history books! The Wikipedia page (i.e. at the time of the suspension for darkness on 23 June) has statistics for the match in process, but I did want to point out a couple of statistics. Mahut has 95 aces, and Isner has 98 aces. Further, Isner has had 4 match points, and Mahut has had 0. Both players seemed unable to break each other's serve and I can't imagine the degree of fatigue each must feel. I'm not sure how they're going to get out of bed tomorrow to play, but hopefully the match will conclude (i.e. FINGERS CROSSED) tomorrow. Even though grass courts don't appear to be Isner's forte, I predict that he wins. So many people are so quick to hate and not congratulate. Have you see, Ron Artest's post-game interview after the Los Angeles Lakers defeated the Boston Celtics in Game 7 for the NBA Championship? The sincerity in his emotions and the joy in his actions and his voice are visibly and audibly genuine. I'll be the first to admit that I'm not the biggest Ron Ron fan, but I cannot help but like him after watching him come up huge in a couple of games in this series and after this interview. Sports are one of the few forums where men will actually let down their guard and let out their human vulnerabilities. Men can play the game like boys and still come out champions! Want to know what happens after the interview, when Ron went to "the Club". Well, according to the following ESPN article by Sam Alipour, Ron Ron went out to "the Club" in full uniform and then eventually gave his uniform to Chris Brown. Why not?!?! It's Ron Ron... He's come a LONG way from the Pistons-Pacers brawl. He's a Champion now. I just wrapped up my "meeting" with Algeria and all I can say is WOW... 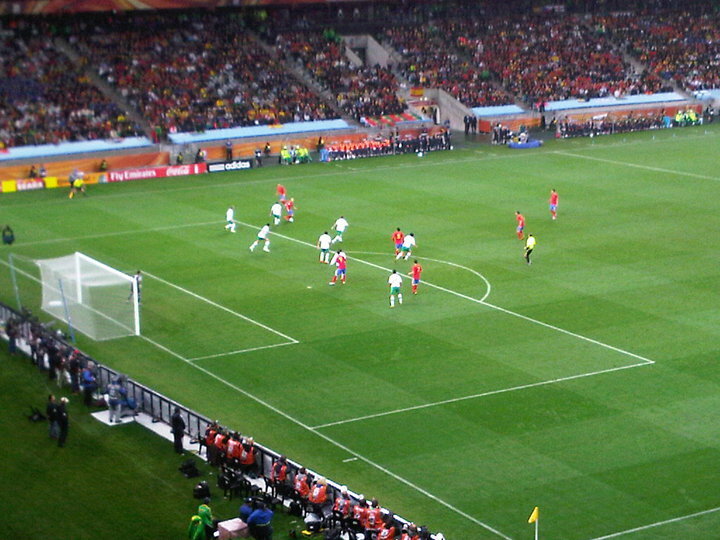 It took about 91 minutes, but Landon Donovan came through for USA in the 2010 FIFA World Cup game against Algeria. Now I'm not saying that there was a complete work stoppage (i.e. think Tiger Woods and Rocco Mediate Sudden Death, circa US Open 2008), but the noise level has increased tremendously now that the USA v Algeria game is over. If you missed the meeting request, USA won 1-0. The population around here has gone from 4 to at least 30 by now. Basically, it was an "all-hands" team building session and morale is up in the office as a result. I wasn't able to join the meeting until the last 8 minutes, but from what I understand USA scored twice, but had their goals taken away with two offsides calls. De ja vu... Just saying. With about 15 mins left in the "meeting", my friend gave me an update that it was tied at 0 (i.e. the Bears were winning <-- Ferris Bueller reference). He told me that USA had to win to advance, since it looked like Slovenia was going to lose to England. I wonder what people will be talking about?!?! By the way, have you seen Landon Donovan's ESPN commercial yet? If not, here you go. 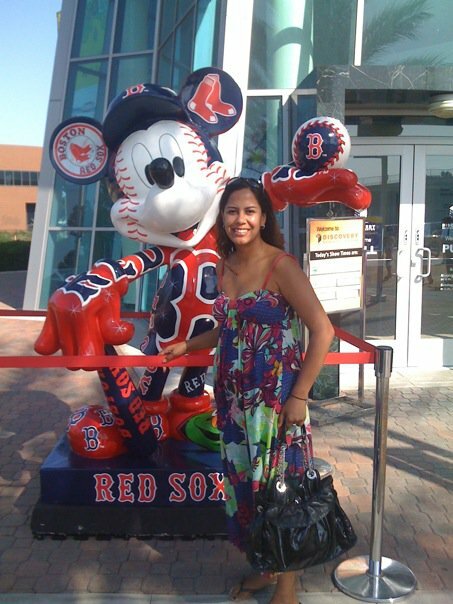 I completed the 2010 MLB All-Star Game Mickey Mouse Scavenger hunt (i.e. 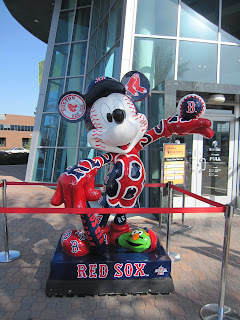 in Southern California) and it's been brought to my attention that the Boston Red Sox Mickey Mouse has been vandalized. According to the following MSNBC article, the Boston Red Sox Mickey Mouse has been sent back to Disney for repair. The statue was vandalized on Friday and removed on Monday. Come on, people. It's a statue and it was in front of the Discovery Science Center. 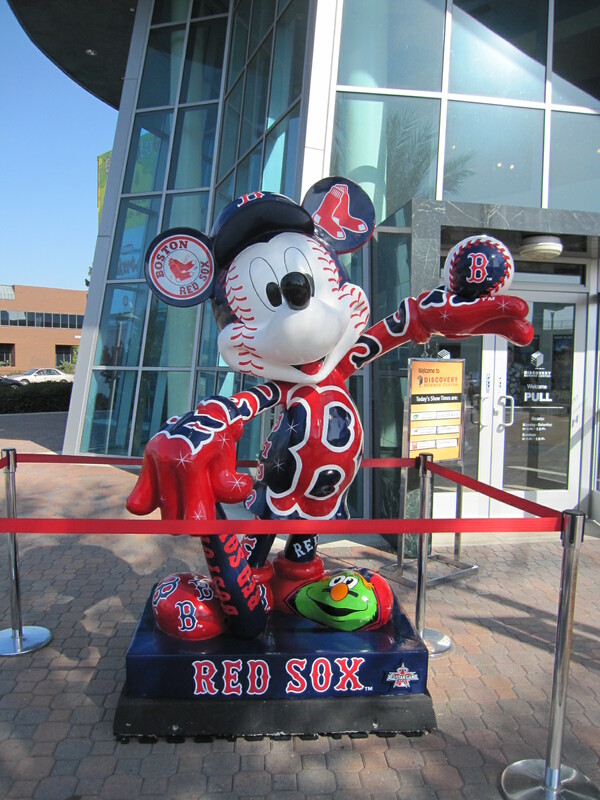 If you don't like the Red Sox or any other team's statue, can't you just walk away from it? Let the kids enjoy it. So in 2010 FIFA World Cup action today, France lost to RSA (i.e. the Republic of South Africa) and all I know is that a few of the French players refused to practice. According to the ABC News article, "On Sunday the French players refused to practice to protest the decision by the French soccer federation to send home forward Nicolas Anelka, who reportedly insulted Domenech at halftime of a 2-0 defeat by Mexico last Thursday. " Well, we all know now how that worked out for the French team. France lost today, with a final score of 2-1. If you want a game recap, use this ESPN link. If you want to laugh, check out the following video of a remix from DJ Steve Porter. It has Allen Iverson, Jim Mora, Dennis Green, Joe Namath (i.e. incidentally, who can forget that sideline interview?!?! wow...), Mike Gundy & Terrell Owens. Have we learned nothing about the value of practice?!?! Yesterday I was running around the Newseum and I saw Katie Smith. I didn't recognize her, but my friend did. Being from Ohio, I remember watching her in college at The Ohio State University. I remember her outside shooting. I have no recollection of her making a lay-up, because when I saw her on TV, she was always launching 3s. Katie Smith led Ohio State to a Big Ten championship and the NCAA title game as a freshman, According to her Wikipedia page, she also broke the Big Ten scoring record for points scored in a career, in men's or women's basketball. Katie Smith is the the first female Buckeye athlete to have her number retired. I don't follow the WNBA, but I went to a few Cleveland Rockers games. Being in Cleveland during the NBA off-season, my ex-fiance would be asked to come out and show support for the Rockers so we'd go to a few games. I remember that there weren't that many fans in the building, but the fans that were there were LOUD. Back to Katie Smith... According to her Wikipedia page, in 2005, she became the first American female basketball player to score 5,000 total points in a professional career. She is 3rd on the list of all time leaders in scoring in the WNBA behind Lisa Leslie and Tina Thompson, however, she is the all time leading scorer in women's professional basketball with her ABL points included. Needless to say, Katie Smith is accomplished. I thought about going over and saying something to her, but it's all pretty random how I remember her college career and to be honest, I never followed her professionally. She was with a couple of her teammates, and I didn't want to bother her. 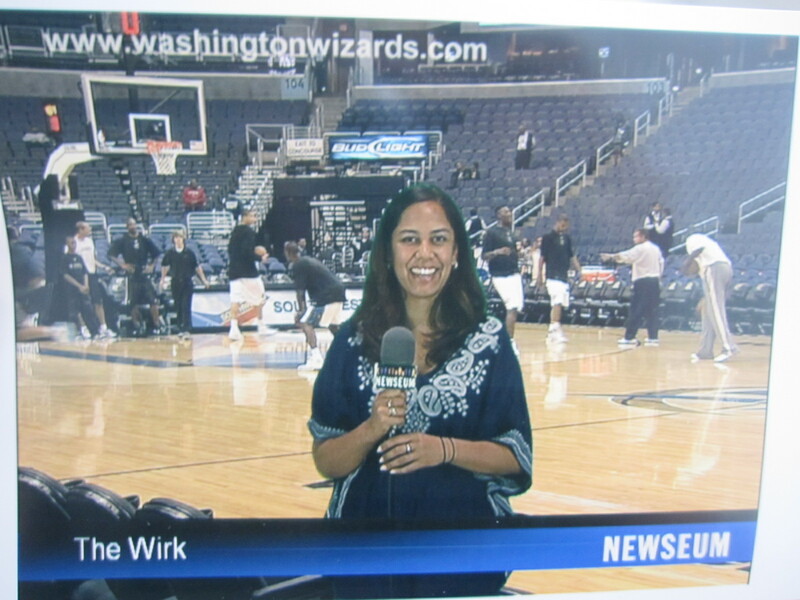 Maybe one day I'll run over to the Verizon Center and catch a Mystics Game and see her play (i.e. on March 16, 2010, Katie Smith signed a contract with the Washington Mystics as a free agent). Now, don't get me wrong ~ I am an Ohio girl and a Cleveland Cavaliers fan, but come on... This is getting silly. What is going through the minds of the team ownership/management? Don't we have bigger fish to fry? Really... Why don't we focus on finding a terrific head coach, and stop focusing on the trivial?!?! "The Cavs have just announced an update to team logos and wordmarks to better represent an "original expression" of the wine and gold colors. The color changes, to a deeper wine and brighter gold, are truer to the hues that were a part of the team’s history from 1970-1983." Now that we solved the logo "problem", what's next on the agenda? 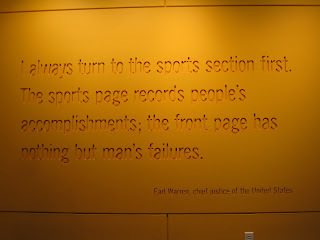 Visit the Newseum: Iooss' Athlete Exhibit, Pulitzer Prize winning photos, etc. If you haven't been to the new Newseum on Pennsylvania and 6th (i.e. it used to be located in Rosslyn), you really need to get out there. If you like the news, journalism, photography, and sports you need to go and see all the exhibits this museum has to offer. Until the end of the year, visitors to the museum can check out "Athlete: The Sports Illustrated Photography of Walter Iooss". This exhibit was the main reason for my visit, since my friend Teri and I had been talking about it for months now. Some of my favorite images from Iooss' work are on display at the Newseum and if you can't get enough of his work, you can also buy his book in the gift shop. If any of my friends or family are reading this post, you can feel free to buy me this book. For someone like me (i.e. who loves sports and photography) this is a a beautiful book. As you progress through the Athlete exhibit you see the images and there are short narratives from Iooss that describe why, how the picture was taken and the interaction with the athlete. My friend has had the pleasure of meeting Walter Iooss, but I on the other hand can only dream of hearing him tell his stories. 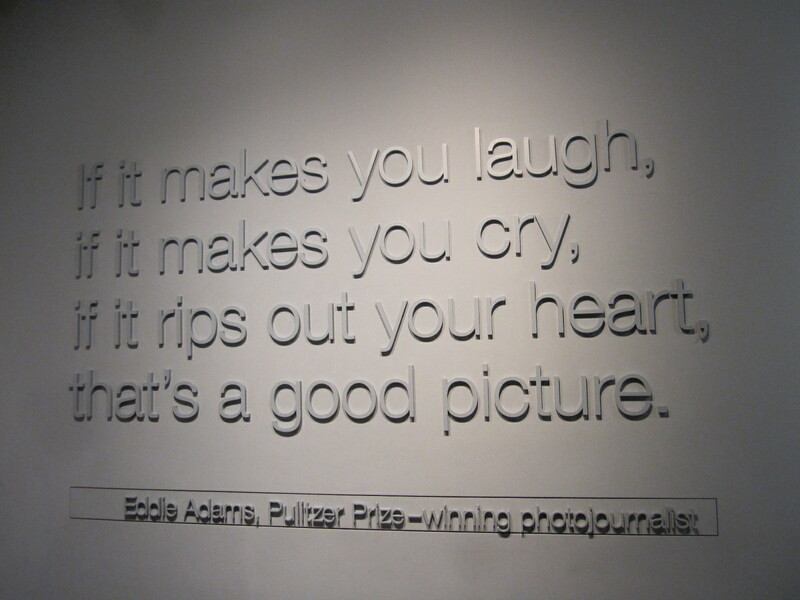 Since the Iooss exhibit is on photography, I thought about it and I don't want to share my pictures of his pictures on here. I want you to go see them for yourself and to read the plaques next to stills. 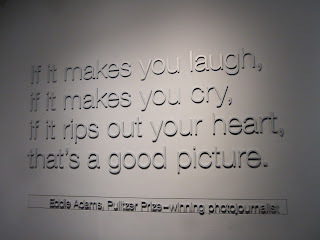 At the Newseum, you can really see what he captured and read the humor and wit that he conveys. For those of you interested in the news headlines from history there is also a section about G-men and journalists. Events such as the Lindbergh baby kidnapping, the Unabomber, and the Hearst SLA kidnapping are covered and on display. 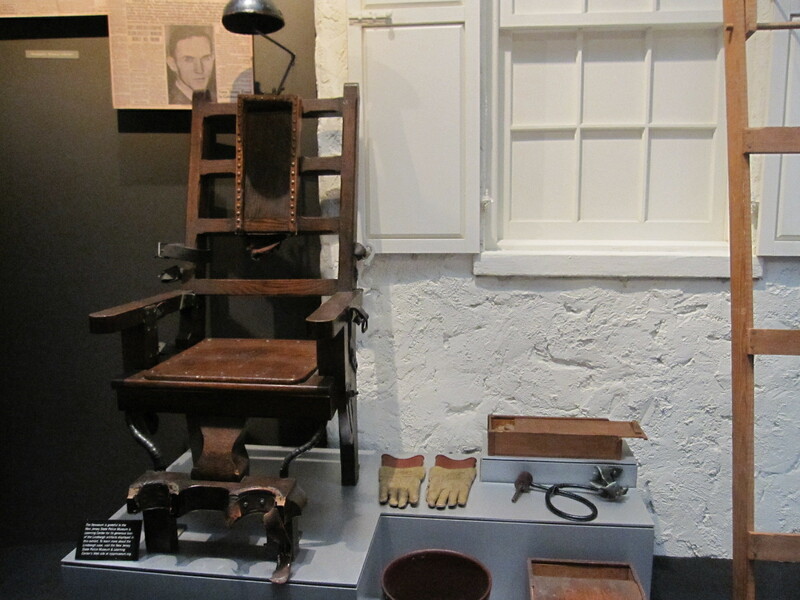 Some of the exhibits can be a little grim and images can be graphic and there are signs (i.e. 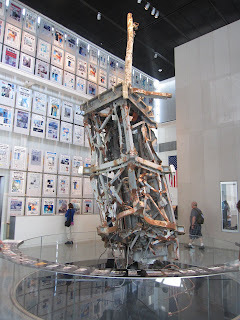 throughout the Newseum) that some of the material may not be suitable for children. 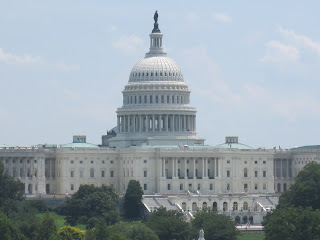 The Newseum offers up great views of the city and there are 2 studios in the facility. One studio is where ABC shoots "This Week". You might recognize that the Newseum offers a great view of the Capitol. 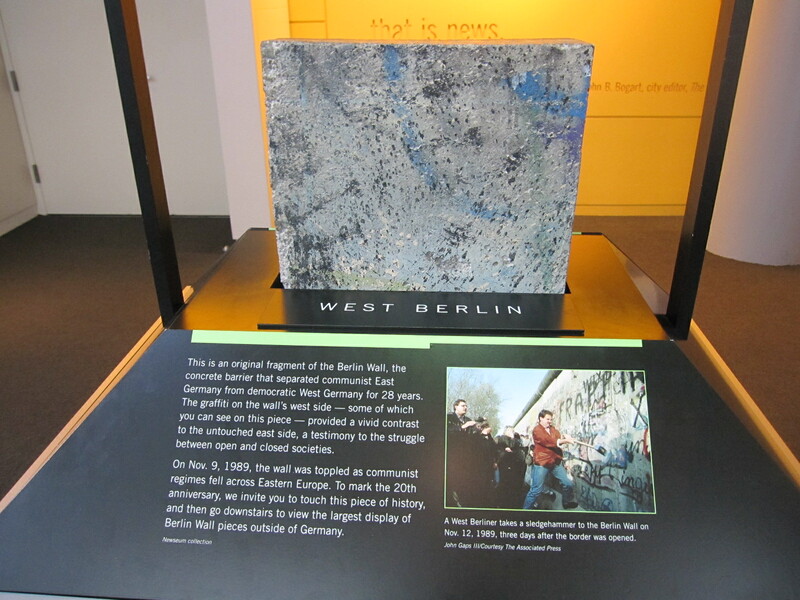 Other notable exhibits include: Elvis, a 9/11 antenna, and the Berlin Wall. 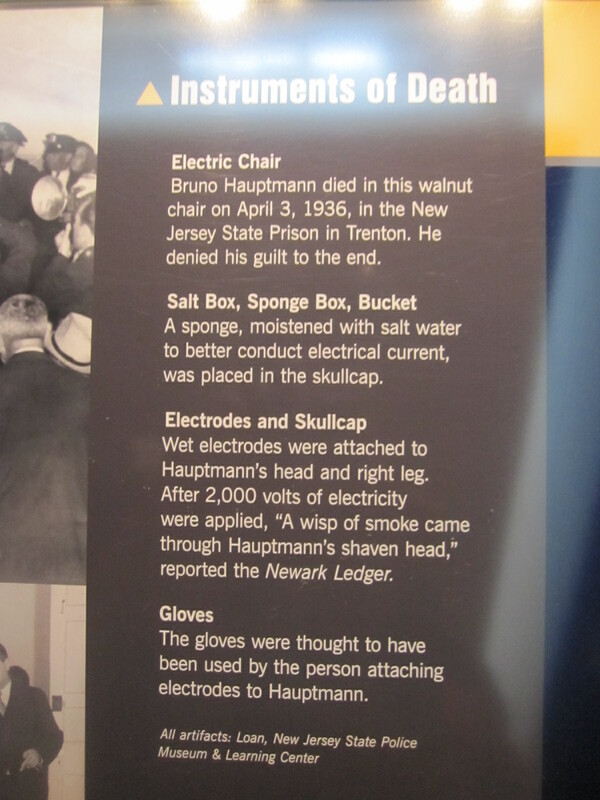 Trust me, there is so much more that can be explored so don't think that is a comprehensive list of topics/exhibits. 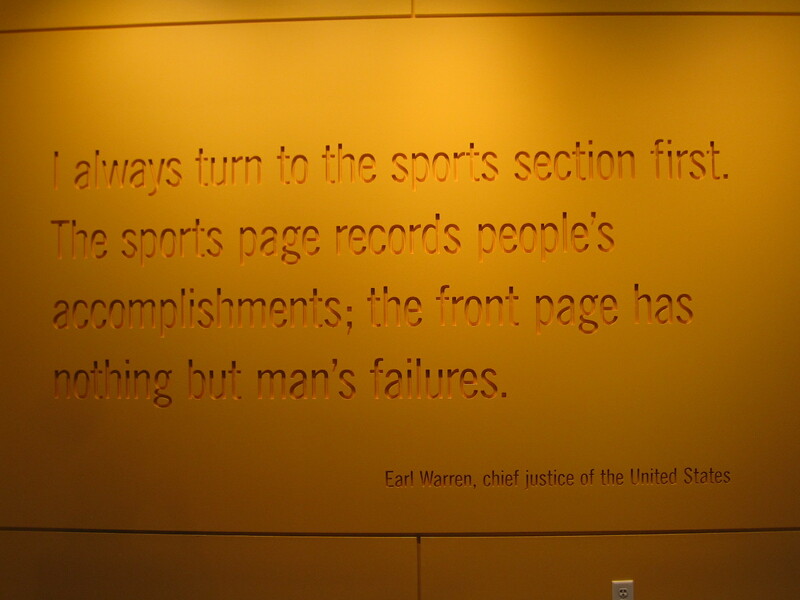 You can literally spend all day in the Newseum. Think I'm joking? The tickets that you purchase for your visit are actually valid for the date you go and the following day, just in case you have more to cover or want to take another look. I actually upgraded my ticket to an annual pass, because there is so much information to absorb and I definitely plan on coming back. In addition to the history and information provided in the other exhibits, there is an area where you can create your own video, read a teleprompter and "play" journalist. You can pick your backdrop and create your video for $5. Don't be shy, people. 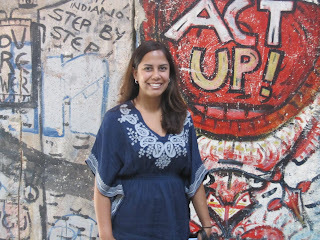 Even though the Newseum does have a great gift shop, I think you should try out this opportunity. 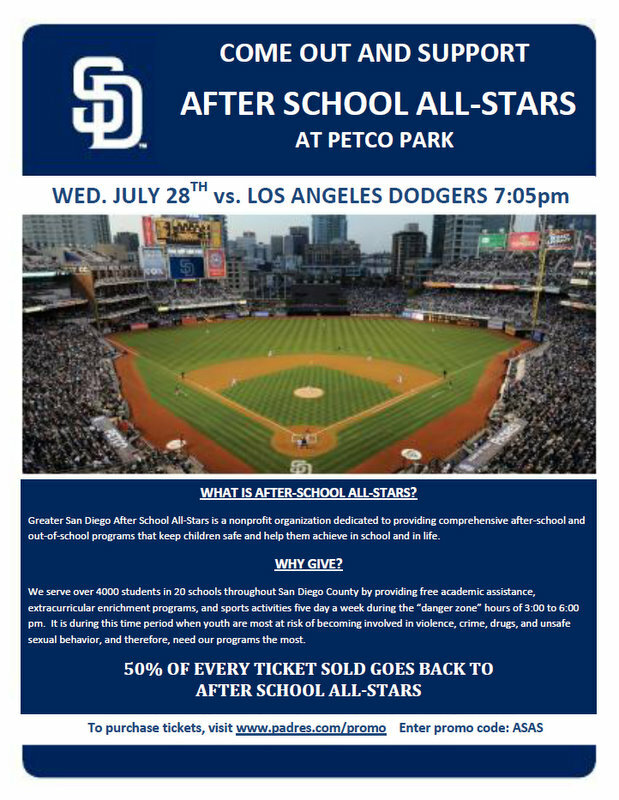 It's only $5 and the experience is fun, so just do it! You can take home a picture and download the video for 30 days. Trust me ~ It'll be the best souvenir you take home. 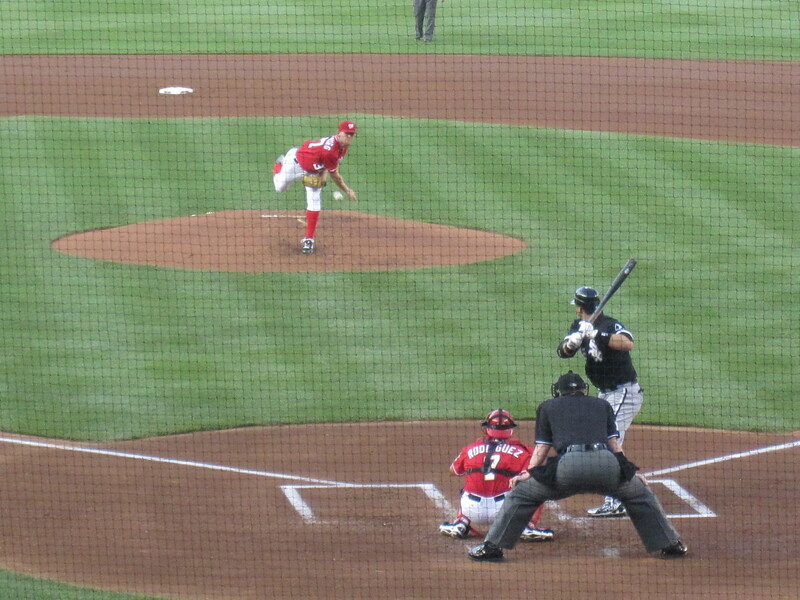 It was a Saturday afternoon and the White Sox defeated the Nationals, 1-0. White Sox pitcher, Jake Peavy, pitched a 3-hit complete-game shutout for the White Sox. Nationals' Manager, Jim Riggleman was thrown out of the game and a couple got engaged in the section ahead of where we were sitting. The crowd's reaction to the engagement was mixed (i.e. girls were happy, men were yelling "think it through). My favorite reaction was Ozzie Guillen motioning to the newly engaged man that his life was over. Hilarious. I highly recommend the PNC Diamond Club for those of you looking for seats. 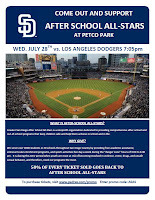 Each ticket comes with a $35 credit for food and drink and there's an air conditioned bar/restaurant area too. For my money, there's no better place to sit. Pat and I were lucky to be sitting in the shade, since it was a scorcher with the heat and humidity. 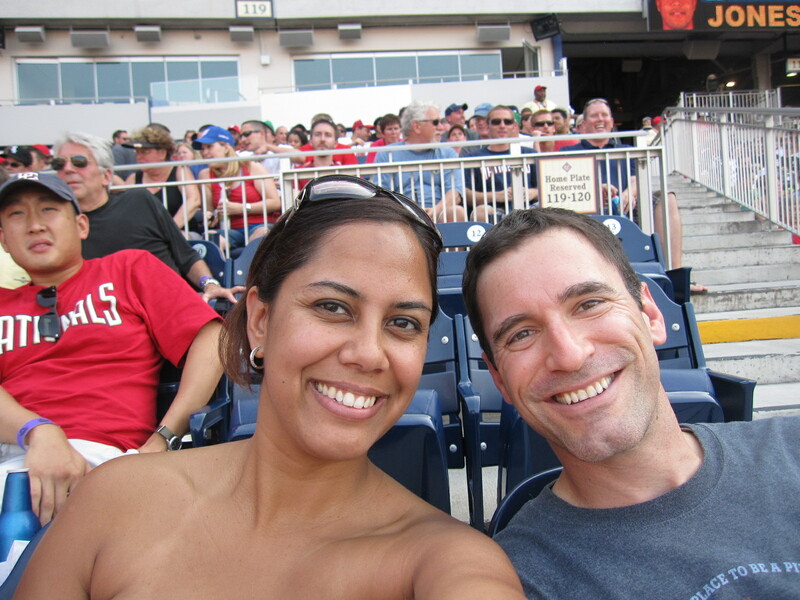 With no real horse in the race, it was a fun afternoon at Nationals Park with good weather and great company! I remember Omar Vizquel when he played with the Cleveland Indians, and it's great to see him still in a uniform and playing. 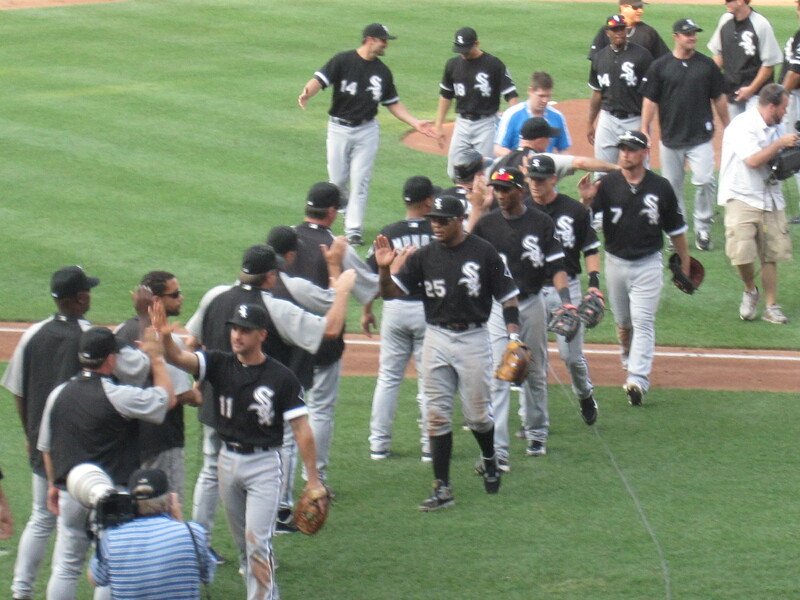 With the win yesterday, the Chicago White Sox had won 5 games in a row. Needless to say, I've been busy today and have no idea what happened in this afternoon's game. Yesterday I told my friend, that I'd take him out to dinner for his birthday. However, later that day, I realized that Washington Nationals', phenom Stephen Strasburg, was pitching against the Chicago White Sox. Change of plans... So much for dinner, my friend and I were going to go to a baseball game! 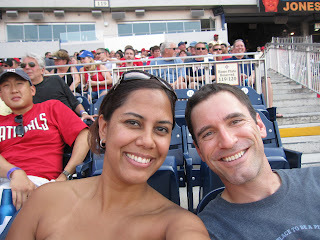 It was my 2nd trip to Nationals Park (i.e. this year) and DJ and I settled into our seats in the Diamond Club. 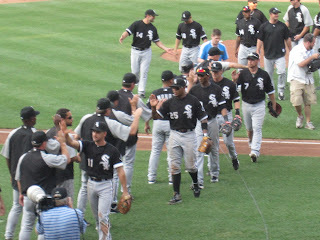 White Sox scored first and the score was 1-0 in the 1st inning. We both love baseball so we started to look around the park, and then we noticed that there was a lot of activity in the suites. 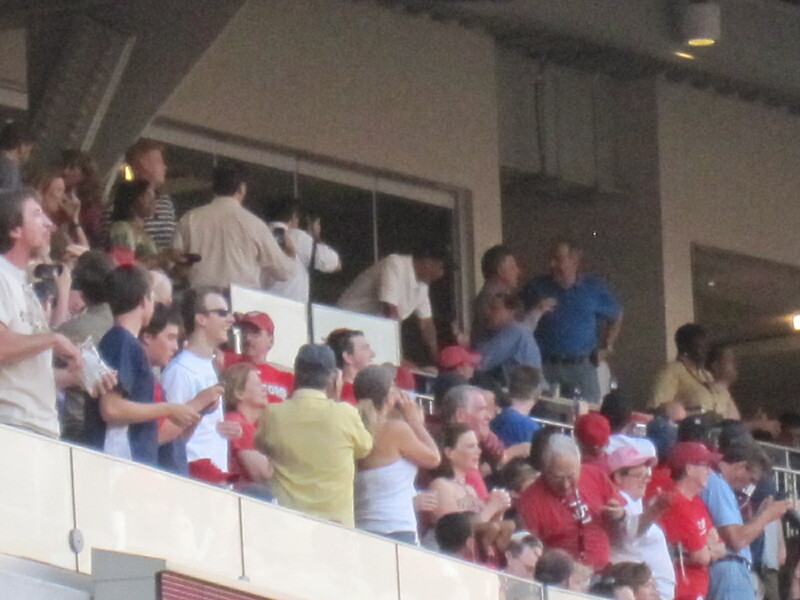 Yep, turns out that President Obama was at the game also. If you ask me, our seats were better ~ but of course, he needs to be shielded/protected and the suites offer him that. 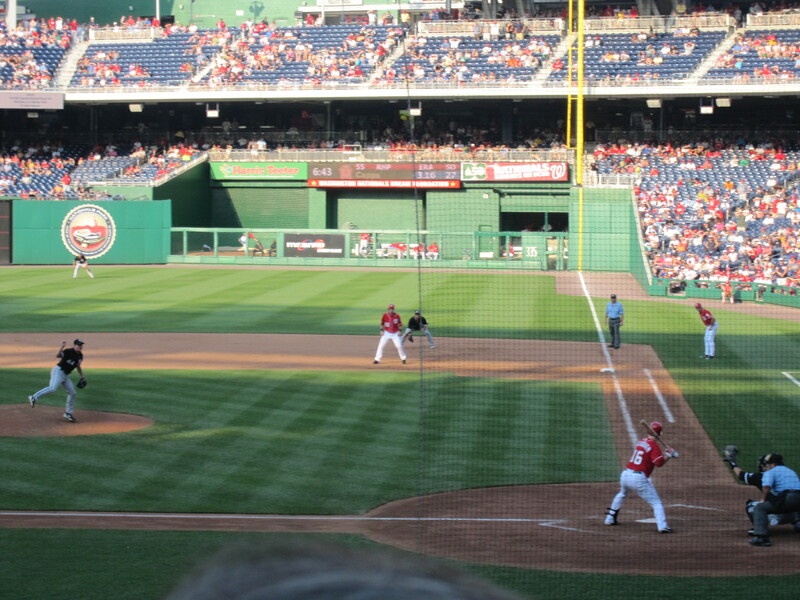 With Strasburg on the mound, I wanted to sit behind home plate and see what it was like to have him throw "at me", and if you ask me the seats were a deal since each ticket came with $35 to spend at the game. 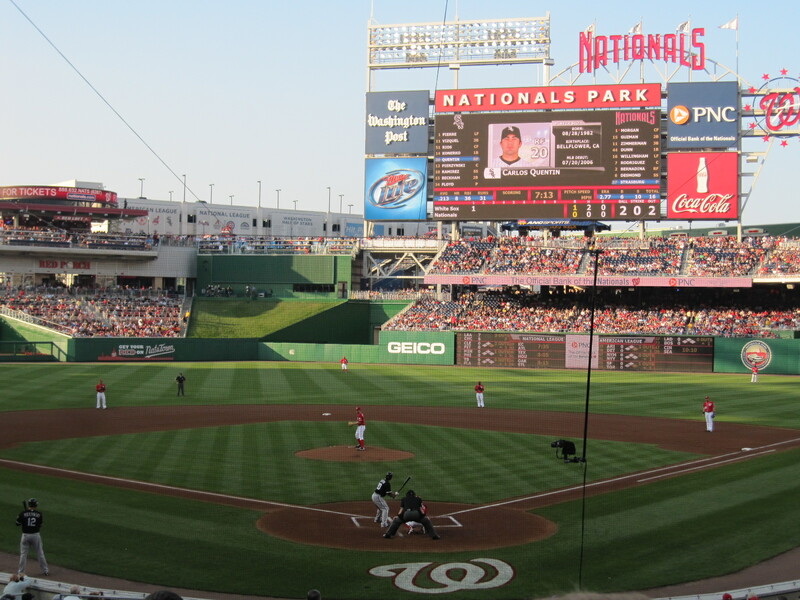 Plus, since the tickets weren't scanning properly, the lady in the Diamond Club gave us $70 in Nats Bucks! Together, between the 2 of us, we had $140 to spend on food, drink, and merchandise. 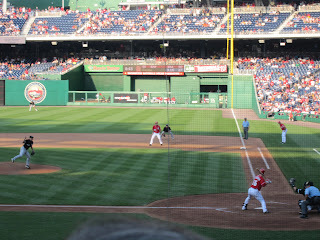 Thanks for the free food and drink Washington Nationals and extra thanks for my new Stephen Strasburg jersey! Can't make it to the game or need some gear for the next time you see Strasburg pitch? Here's a link to his jersey so you can buy one also! Here are some other pictures snapped during the game. 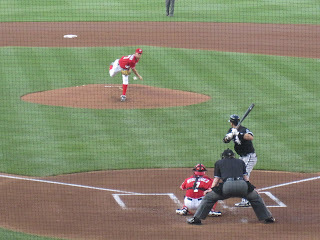 It took extra innings, but the Chicago White Sox defeated the Washington Nationals, 2-1. Looks like another great day for some baseball ~ take ME out to the ball game! Whatever happened to Tab Ramos and that Snickers Commercial? Tab Ramos on the other hand is much older. I didn't know he was born in Uruguay... According to Wiki, "...after playing for the US in the 1990 FIFA World Cup, he was named U.S. Soccer Athlete of the Year in 1990. Ramos was elected to the National Soccer Hall of Fame on the first ballot, in 2005." The Wiki page goes on further to say that he's retired and living in New Jersey. Do you remember his Snickers commercial? I couldn't pick the man out of a line-up, but I remember his legs from the commercial! Here's the Snickers commercial, for those of you that like soccer players and candy. Enjoy! This is a picture of my losing betting slip. The Lakers are the new NBA Champions, as they defeated the Boston Celtics tonight by a margin of less than 7 points. During the games, when I watch from home I usually am logged into my Twitter account, to further entertain myself and read other people's witty comments during the game. I follow about 100 other people. If you're sports-related and you make me laugh, chances are I follow you. Now, being that I knew the spread I knew exactly what they were talking about! Ever argue with a fan of a losing team? It's pointless. Friends shouldn't use another person's facebook pages to vent about their team's loss. I didn't beat the Celtics. I didn't play a single minute or score a single point. I was at Game 6. I'm an old school Lakers fan, even though I'm not a Kobe Bryant fan. After what I saw in Game 6, and knowing that Perk probably wasn't going to play in Game 7, I thought the best bet was Lakers -7. Turns out, I was wrong. But ~ am I the one crying about my loss? Nope. Instead, I get this exchange ~ which is here for your reading pleasure. They say a picture is worth a thousand words, but in this case it's worth about 40 comments! **** And yes, I edited the exchanges because one day my mom might read this blog! Cry Baby: Yeah I'm glad u lost that bet. I hope u put a lot of money on it. Me: hey, poor loser, are you blind? 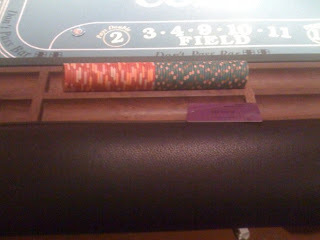 it's only 440, and i cleared $1100 with craps so who cares. Cry Baby: Glad u lost. Cry Baby: Not on ur page, don't over-indulge yourself. Me: yeah - you are. it's my pic. Cry Baby: Screw your $440. Glad you lost. You have nothing to show for it. You know you're not a Lakers fan. You rooting for White Sox tomorrow too? I bet you are. Me: i have tons of kareem stuff and magic posters in my bedroom (i.e. childhood bedroom and colllege dorm room). $440 is nothing (i.e. i'd won a lot more in vegas recently) - i don't care about it and that's why i bet it. go cry. get a life and stay off my page. 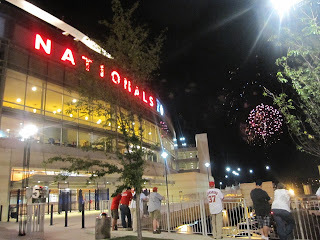 and yes, i would bc i don't care about the nats. 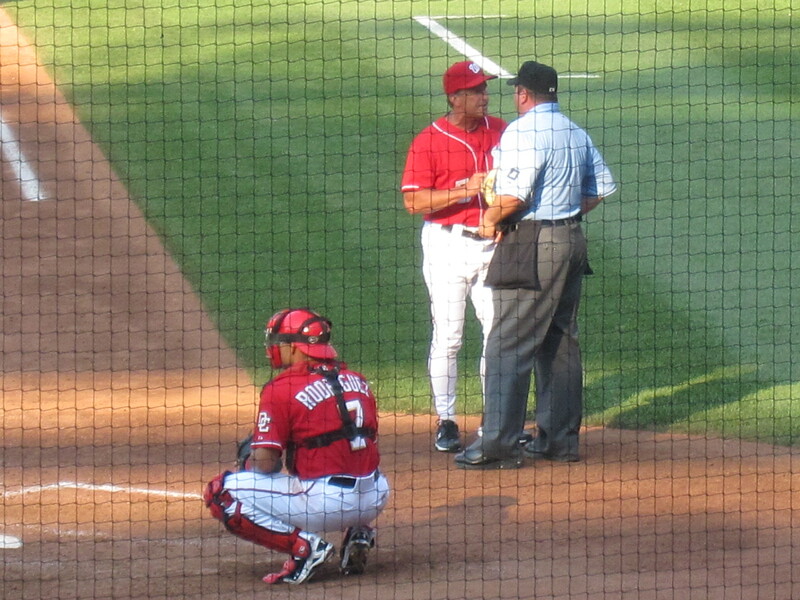 i'd root for strasburg though. Cry Baby: Cavs are dogsh*t. Swallow that. Cry Baby: do you EVER work? 71 venues is indicative of a tough work schedule. Cry Baby: You know what, nevermind. 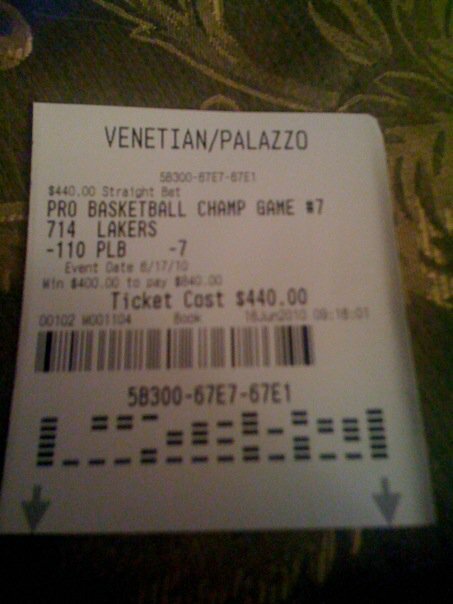 Go Lakers in your head. Your allegiance it commendable. Me: i grew up on the lakers. and became a CAVS fan bc of my ex-fiance and being that i'm from ohio. maybe one day you'd actually know what you're talking about and then who knows you could possibly be dangerous ~ not saying you need to read my blog, but if you can read - perhaps you should check it. i'm a lakers fan but anti-kobe, but last i checked he's only 1 player. Cry Baby: Traitor Go White Sox huh? Me: get a life, and sure - why not? i'm not from here. Cry Baby: In the end, Lakers are still 2nd best. Bite me. Cry Baby: So The Wirk is all about the Lakers next year? Or whatever team LaBron goes to? Or a hybrid or either??? Or do you dare to follow the Cavs no matter what happens? Me: everyone is a potential reader! next year is next year - read the blog and find out. Cry Baby: Honestly, u shouldn't be slanted in any direction to be a reputable writer. Cry Baby: That's fine. I remember being remotely interesting when you posted me on your blog when the C's beat the Cavs this year. Congrats, your favorite team won the title this year!!!! Good for you!!!!! Cry Baby: Has nothing to do with my last statement. Now ur just saying ur cooler than I am. Sweet. I'll wake up tomorrow morning and beg to God I can be as cool as you some day. Me: not sure when your boss wants you at work, but if you're gonna add prayer to your routine, you should go to bed soon. have a great night! sportspickle Is Bill Russell getting so old he thinks he played for the Lakers? 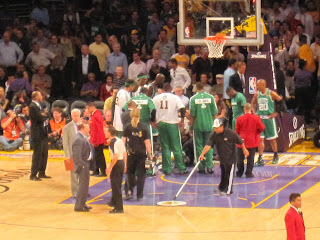 --- Good to know that I wasn't the only one who thought it looked strange to see Bill Russell with all the Lakers. THEWIRK: is it bad that i chuckled that ron ron thanked his psychiatrist... what a game though ~ he was stellar! --- You have to give Ron Artest his props. He played HUGE. sportspickle: And Scalabrine is back in the game. Shelden Williams should probably retire now. THEWIRK: my twitter feed has "brian #scalabrine" trending and not "justin #bieber"... the world is coming to an end! 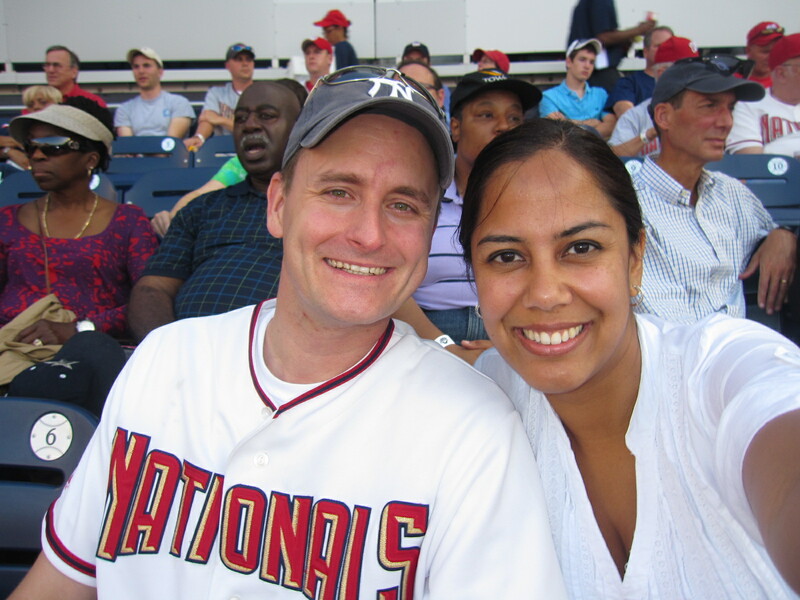 Now like, I tweeted we wait for football and enjoy the summer with baseball... Take me out to the ball game! Thanks for your continued support and comments. I appreciate the readership as I build TheWirk.com. Today, was a milestone day as together, we achieved greater than 10,000 hits! 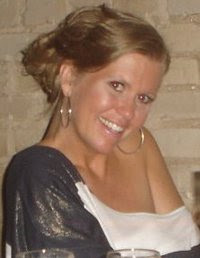 I look forward to bringing you more great stories, headlines, and adventures in the future ~ while subtly (i.e. and not so subtly) encouraging you to live YOUR life to the fullest. On June 17, 1994 O.J. Simpson was declared a "fugitive of justice" and drove his white Ford Bronco down the freeway in LA. I didn't catch the episode, but ESPN has a new 30 for 30 documentary out that night describes it "all" http://espn.go.com/video/clip?id=5287804. Where were you the night of O.J. 's car chase? I know exactly where I was. I was in Bulger Hall waiting for the guys to get ready so we could go out, but no one was leaving because they thought O.J. was going to die that night. I never really paid attention to football O.J. I only really knew him as "Naked Gun" O.J. Oh well. I can't believe it's been 16 years. By now we all know that Game 6 of the Boston Celtics v Los Angeles Lakers series was a blow out. 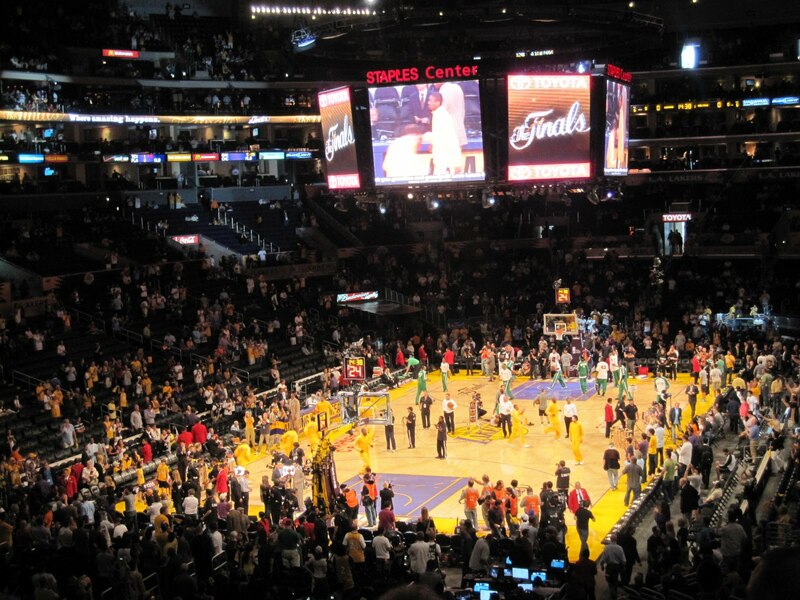 Being that the Lakers had to win or go home, it was a HUGE game for Laker fans. 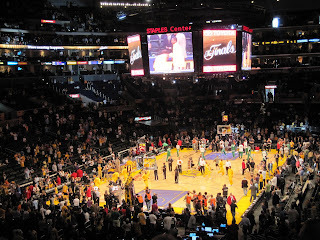 The ONLY place to be for a Laker fan with the means and a little bit of luck was the Staples Center! I should've known that the Lakers were going to win when I was walking into the arena. I am usually good luck. Also, while walking into the building I heard the ESPN radio guys, say that Tom Izzo turned down the Cleveland Cavaliers job. **** Yep, you were right, Soup. I should've listened to you, from the start! Christina Aguilera sang the National Anthem before the game. 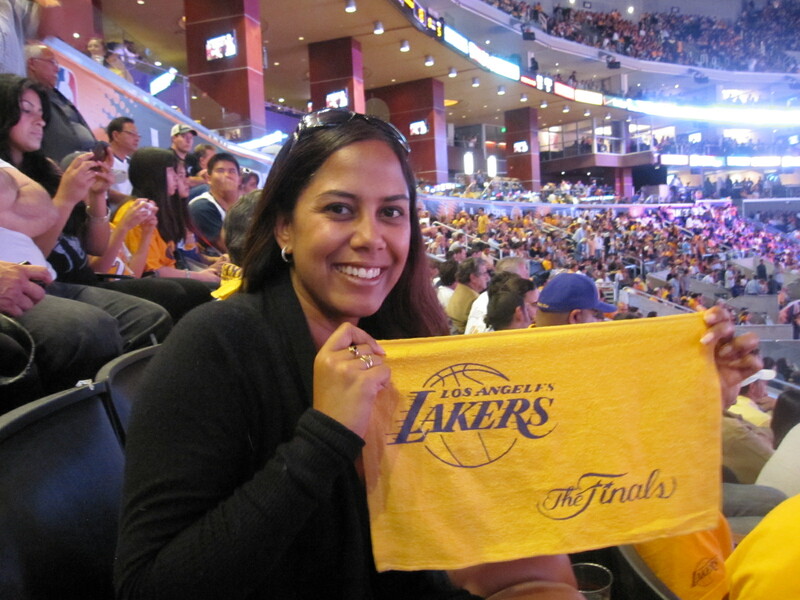 She watched most of the game with her husband in seats on the baseline. I posted my pictures from the game 6 last night, and a friend pointed out today that the score with 1:55 left in the 4th Q, was the final score of the game. NO buckets in the last 2 minutes of the game... I guess, why even bother. The Celtics had basically stopped competing and the number 59 seemed to live on the scoreboard for the longest time. 59 points. If you would've told me that the Celtics would have scored only 59 points, "For the Longest Time" (i.e. now I have that Billy Joel song in my head), I would've told you that you were crazy. Kendrick Perkins' presence (i.e. or lack there of) was palpable. He left the game in the 1st, with what I hear is a hyper-extended right knee. I never really realized how much of an impact he made, until he was gone. Great. Now I have a song from the hair band, Cinderella, in my head. If you want more information on the injury or want to see the video, check out Sekou Smith's Hang Time Blog. According to everything I've read and heard, Perk isn't going to play in Game 7, Thursday night. 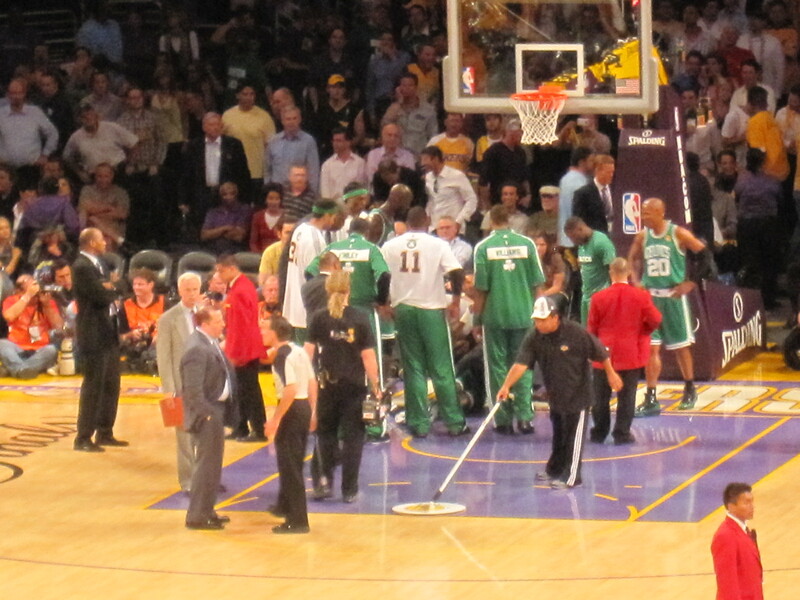 At the end up the 1st Q, the Lakers were up 10 on the Celtics with a score of 28-18. 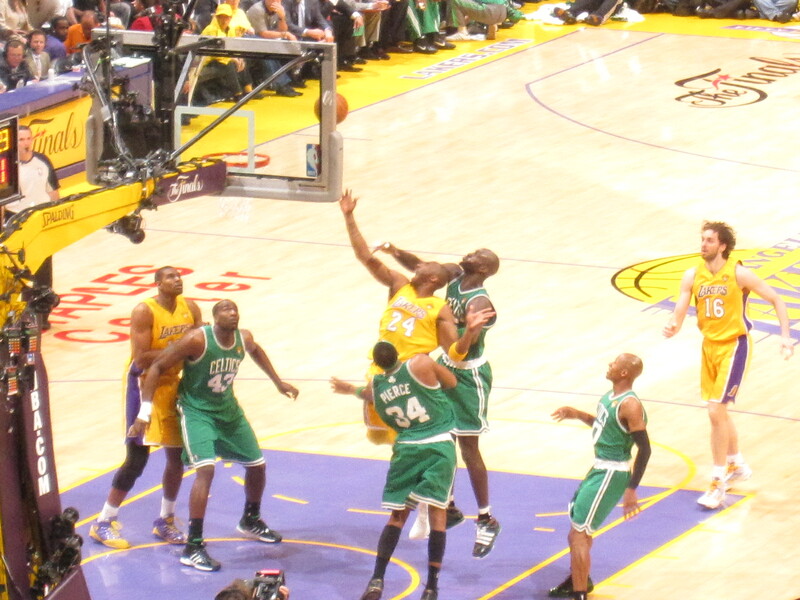 At the end up the 2nd Q, the Lakers were up 20 on the Celtics with a score of 51-31. As much as I'm not a Kobe Bryant fan, I have to admit he does put up excellent numbers. Numbers don't lie. He ended the game with 26 points, 11 boards, and 3 assists. I was lucky enough to score a ticket at the last minute to Game 6. 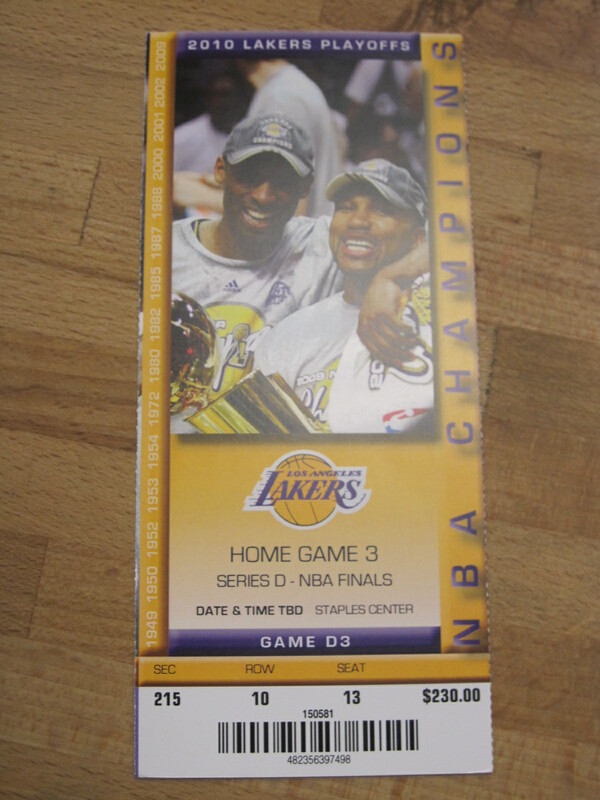 I was on my way to the Staples Center and ended up parking in the Venice garage on/around 15th and Figueroa for $12. The garage was just past the Convention Center. Thank goodness I got there early, since the parking lots (i.e. that weren't already full at 4PM) were filling up quickly. At the arena, I immediately texted my friends and gave them my coordinates, but I wasn't about to get up and chase people around. I'd just finished my Mickey Mouse Scavenger Hunt, and I was exhausted. 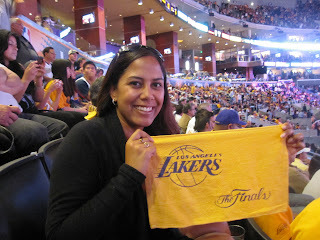 I wanted the game to begin, and I was surrounded by a sea of Lakers fans. That reminds me, I couldn't help but notice a Celtics fan who had a purse. I swear it was on his shoulder. Now I realize it's probably his wife's purse, but seriously?!?! **** Ladies, don't make your men carry your purse ~ it makes them look ridiculous. If you love your man at all, carry it yourself. The guy was getting ripped on by entire sections in the arena the entire game, and if you ask me he was asking for it. It definitely wasn't the smartest move he could've made. Game 6 ended with a final score of 89-67. Lakers dominated. Game 7 is Thursday night at 9PM EST. I won't be at the Staples Center, but I'll be watching.